Nicolas Carmarans makes wines from indigenous grape varieties clinging to steep terraces in the remote Aveyron region of central France. For many years he ran the delightful wine bar in Paris called Café de la Nouvelle Mairie. It, as its name suggests, is a meeting place where people go to sip on good wines, eat interesting food and solve the problems of the world. 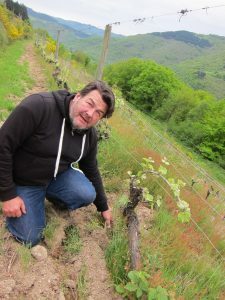 He sold it recently to concentrate on his vineyard in the Aveyron in south west France where he makes stunningly delicious natural wines from local grape varieties such as Fer Servadou and Negret de Banhars. The wines are released under the local IGP appellation of Aveyron (this is the new Indication Geographique Protegee which protects wines produced in the area). In addition to his Mauvais Temps vineyard, Nicolas has recently bought a new house and built a new winemaking facility in a stunningly beautiful and very peaceful, remote area on the slopes above the Selves River. Here he has also planted a new vineyard to Chenin Blanc and Fer Servadou. 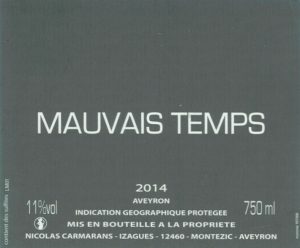 The Nicolas Carmarans Mauvais Temps is a particular favourite. This light, but complex red wine from the Aveyron in central France is lively, exciting, delicious and leaves you wanting more! The wine comprises three grape varieties, namely 40% Negret de Banhars, 50% Fer Servadou (known locally as Mansois) and 10% Cabernet Franc. The grapes undergo semi-carbonic maceration in 15 hectolitre wooden conical tanks for 20 days and the juice is then transferred to old barriques for 12 months. The vineyard is very steep with narrow terraces covered with native herbs in a stunning valley near the village of Campouriez. The Nicolas Carmarans Fer de Sang is made from 100% Fer Servadou (also known as Braucol and Mansois in other regions) sourced from a vineyard south of Nicolas’s house in the Marcillac region. Here he has sourced grapes from vines that are 70 years old that are growing on limestone soils at an elevation of approximately 250 metres above sea level. He places the grapes in fibreglass tanks to undergo carbonic maceration for about 10 days before being transferred to old barriques for seven months. The Nicolas Carmarans Maximus is a fresh, vibrant red wine that sees 16 days of carbonic maceration to ensure the freshness and flavour that you expect from a wine made using this process. The 2014 vintage is definitely the best yet! It is lower in alcohol, lighter, fresher and more elegant than before. But flavour has not been sacrificed. This is in line with our tastings of this wine since Nicolas started producing it – it just keeps getting better and better. 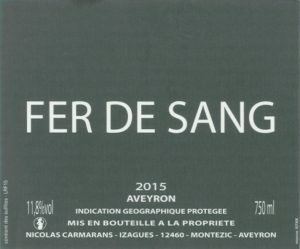 The wine is made from Fer Servadou (also known as Mansois) which is local to the region around the Aveyron and then in an arc down to the area around the town of Gaillac which is just north of Toulouse. It is aged in barriques and bottled without the addition of any sulphites to retain the freshness. This wine can be drunk as an aperitif or matched to quite a wide range of foods. Nicolas farms organically and practices minimal intervention in the cellar with native yeast fermentations, no temperature control, no sulfur, and no filtration. 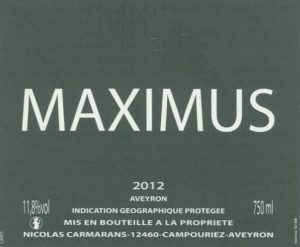 Maximus is an invigorating wine made from Fer Servadou, a native variety, and undergoes carbonic maceration, preserving the fresh fruit characteristics of the grape. It is deep and bloody on the nose with cranberry, blood orange, iron, tomato leaf, pink peppercorn, and smoke. Fresh, zippy, and lighter in body with high-toned red berry fruits and notes of turned earth and spice on the palate, this would make a wonderful companion to a wide range of foods and is great on its own. 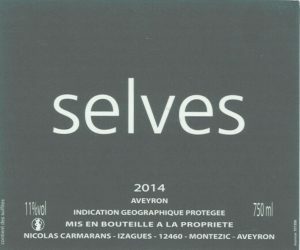 The Nicolas Carmarans Selves is produced from old vine Chenin Blanc plus some grapes from his newly-planted vineyard on the Selves River slopes that thrives in the cold valley near Campouriez in the Aveyron. This is an unbelievably beautiful wine for those who love the power and elegance of this much sought-after grape variety. When we tried it this year during a lunch at chez Nicolas overlooking the beautiful river that meanders through the steep gorges here we were stunned again by the purity and elegance displayed by this wine. 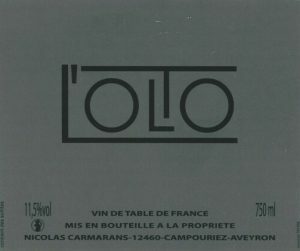 The Nicolas Carmarans l’Olto is a single varietal 100% Fer Servadou (known locally as Mansois). The vines that the grapes come from are reasonably old and thrive in clay soils on the side of some very steep slopes that have terraces created to enable the pickers and pruners to work on these slopes. The grapes undergo semi-carbonic maceration in 15 hectolitre conical tanks for 20 days and are then transferred to old barriques for 12 months. Before bottling, the tank spends a day in the sun to give it more strength says Nicolas. We have some magnums of the amazing wine produced by Nicolas and his friend Bruno Duchene. Bruno is imported to Australia by our colleague Andrew Guard. We import the wines of Nicolas Carmarans from the Aveyron. So, what happens when these two amazing winemakers get together and make a wine together? 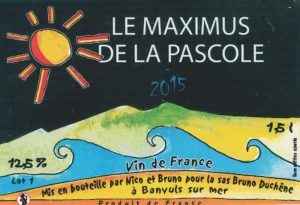 The result is the magnums of Maximus de la Pascole of which both we and Andrew will have very limited quantities. Anyway we have a few of the magnums so we are listing them here.